Lately we’ve been bugged about this idea that SEOs still face a lot of challenges in their work, and they could do with more support or automation in some areas. So we created this new, completely free tool that provides on-the-spot, sharp data about web pages – we call it AWRStudyr [read: stədi-ər]. 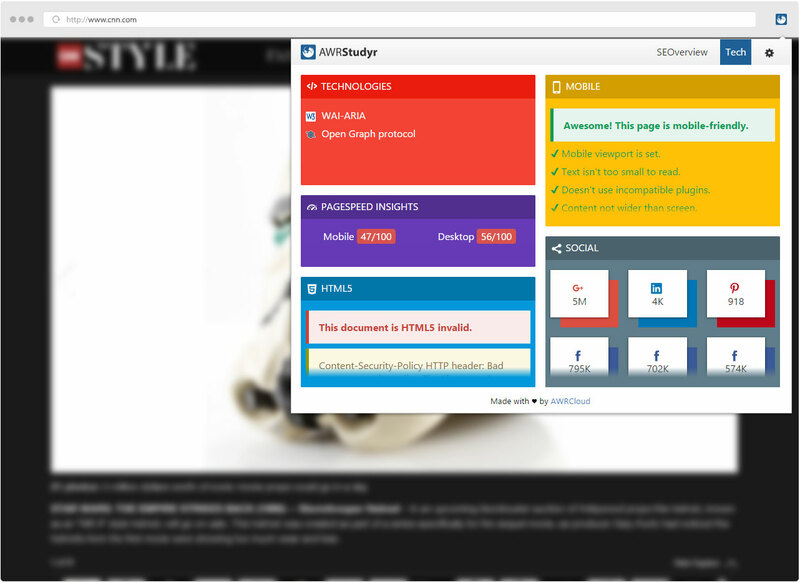 AWRStudyr is a Chrome browser extension that gives you a quick overview of SEO and other technical elements of a web page. Use it to asses your own website/s, to perform swift competitor research, or to assist you with client presentations or pitches. Just think about it – you’ve created this great content piece around a keyword that both you and a competitor want to rank for. Weeks later, you notice your competitor still outranks you, even if you went through all the right steps. But just to make a quick check, you open both pages and run Studyr to get a surface assessment of what your page might be missing, or what the competitor did different that got them to rank better. 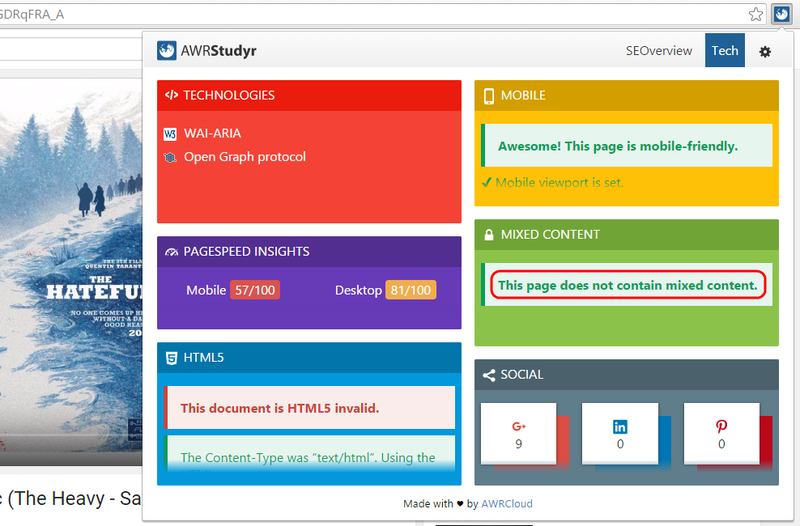 This is just one example of how AWRStudyr can come in handy for SEOs and web developers. 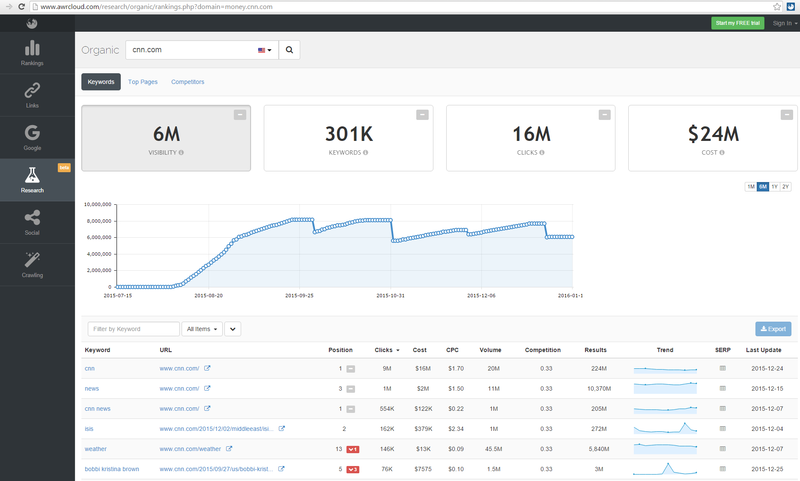 One of the tool’s best features is access to keyword data that’s available through our keyword research database, which is comprised of over 30 million keywords and counting. The data gets updated every 30 days, so you can count on its freshness and relevance. There is no account and login required, and it’s completely free! Install AWRStudyr from the Chrome Web Store. Its clean and straightforward design make it easy to understand the information you’re looking at immediately. This means you can easily describe these bite-sized chunks of concentrated data to clients who might be less tech-savvy. Different sets of data are available in two tabs, each with its own purpose and utility. Here’s what you’ll be looking at, and what each information box represents. Okay, this is exciting. All this neatly packed data is making us grin uncontrollably. The Visibility Score is an AWR proprietary metric based on the website’s keyword rankings. If you’re not familiar with it, you can read more about how we calculate the Visibility Score here. It gives you a pretty good idea of how a site is doing in rankings. 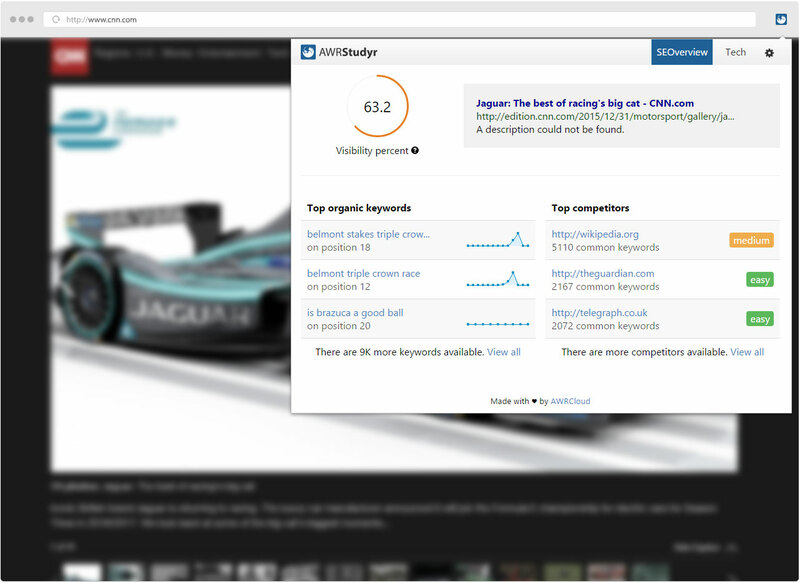 If the data is available, Studyr usually displays the Visibility Score for the URL you’re on. If not, you’ll get a Score for the entire domain. Right next to it, you get a preview of how the URL looks like in SERPs – basically, you see the snippet version of the title, URL, and meta description for that web page. If you do this for your own pages, it can help you figure out if you need to reduce the length of the description so it fits on the page, or rewrite to make it more actionable and persuasive. If you use Studyr for competitors’ pages, you can check out what description formulas they use and what keywords they target. An awesome feature here is that the box also shows you whether the page is Mobile-friendly, something you only see on mobile devices, or could otherwise verify with 3rd party tools. So this is another feature equally useful for both SEOs and web developers. On the bottom left corner of the SEOverview tab you find a short list of the top organic keywords the page ranks for. Like I mentioned before, the data is gathered in real time from AWR Cloud’s keyword research database. If the keywords you rank for match our database, you will see up to three keywords displayed in this box. 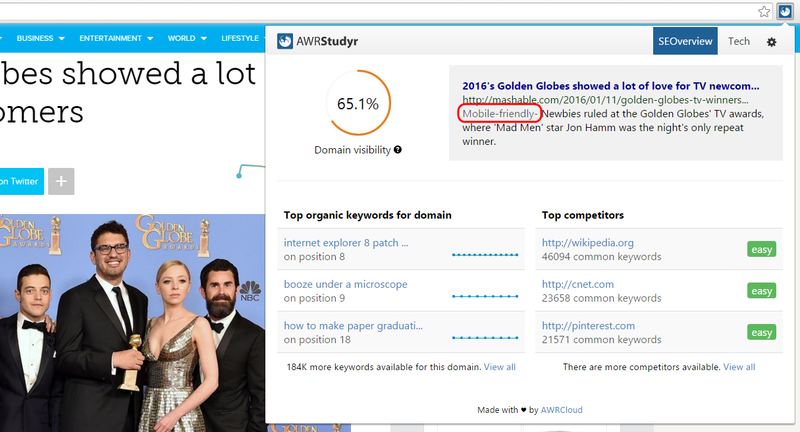 Where page data is not available, Studyr displays top domain organic keywords. You see what positions the URL ranks on for these keywords, and a small graph showing their evolution over the last period (30 days). This is a short preview of all the keywords that you rank for; to see more keywords and metrics for each of them, click the “View all” link and you will be directed to AWR Cloud’s Research menu in the app. But no worries, there’s no login required to explore the Research feature. You will access a free version of AWR Cloud, where you can look over the competitive research data we have available for your website. Access to the information in our keyword research database is limited to 50 daily queries and up to 10 results per query – all other tech functions and features of the extension are unlimited and will bring up results no matter how many URLs you want to analyze. So when you look in the SEOverview tab at your keyword list and click on View all to go to the free version of the Keyword Research category, that counts as a query. If you click on Competitors while inside the AWR Cloud app, that counts as a second query for the same URL. If used right, that’s more than enough information to handle and work with for one day. Data and cats – our favorite things in the Universe. On the right, you find your top three competitors, the number of keywords you have in common, and the level of difficulty in competing with them over the same keywords on that page. This is also a preview, and by clicking View all, you’re taken to the app, again to the Research category, but this time directly on the Competitors tab. Here you’ll see a list with your main competitors and a lot of interesting data like the level of competition (shown in percentage values), the number of common keywords, organic clicks, organic visibility, and more. Click on a competitor and you get even more data and graphs about keyword overlap, competition difficulty for each keyword, search volume, and more. I told you this was geeky fun! Note: Starting August 1st, 2016 the SEOverview Tab has been discontinued. This tab is also full of data that will make your techy feelings tingle all over. Each box expands when you click it, showing the complete information it gathered for your URL. 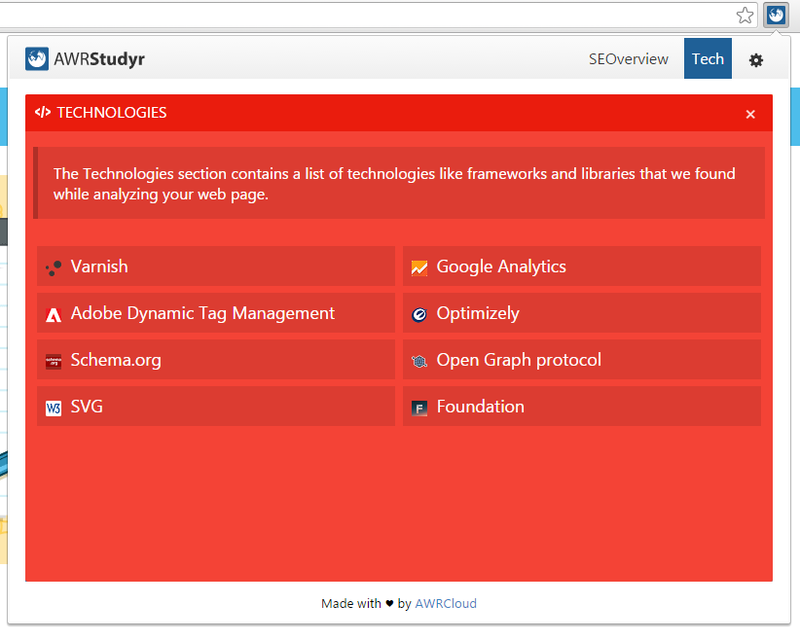 Whether it’s PHP, jQuery, Google Analytics, Disqus, or others, you will see it displayed in the Technologies box. As the tool grows, this feature will detect and include even more technologies, so it will offer an increasingly comprehensive view of the URL or domain you’re analyzing. And there’s of course multiple ways you can use this information. As a web developer, these insights from Studyr either help you verify that the tech you used is well implemented, or allow you to see what others have used. That way, with a single click, you can discover and see the secrets of your competition – in a friendly format. Who knows, it might inspire you to try new things and improve your website. For SEOs and marketers who want to get ahead of their competitors, keep tabs on them, and are always looking for ways to upgrade their website, the Technologies tab is a pretty nifty helper that allows them to visualise new methods for optimization. One of the features that I particularly love about AWRStudyr, and which has great applicability for everyone involved in the online, is the PageSpeed Insights box. The data is extracted directly from Google’s PageSpeed Insights tool, except you don’t have to go to it anymore if you just need a quick assessment of a page’s load time and score. You get the PageSpeed score for both Desktop and Mobile, and it’s probably the simplest way of figuring out if you need to work on improving page loading time for your website/s. Click on the box to expand it, and you get an actionable list of tips you should implement in order to optimize page speed. Next comes the HTML5 box, which checks the markup validity of the page you’re on. The information AWRStudyr displays in this box is highly insightful because it shows you, step by step, what improvements and changes you need to make to your code, and what aspects of markup are correctly implemented. Mobile search has equaled, and even surpassed Desktop in some parts of the world. If you like to stay ahead of the game, you’ve already got a mobile responsive site. If not, it’s time to get moving and optimize your website for mobile. The Mobile box grabs its data directly from Google’s Mobile Friendly Test Tool, and shows you whether the page you’re looking at is mobile friendly or not, while also giving you a few pointers on what works and what you should change. Click on the box to expand it and besides the useful tips, you get a preview of how the page looks on mobile devices. The Mixed Content box is a pretty cool feature because it has great applications for SEO and web development at the same time. 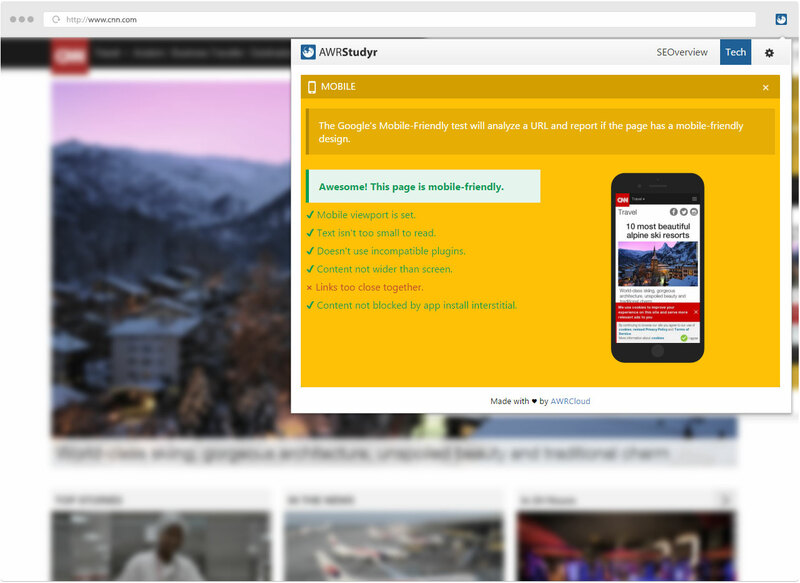 The extension analyzes the page you’re on and determines if there’s any mixed content on it. This tells you whether you’re on a secure page, or if your privacy and security might be threatened by 3rd party resources. For SEO, that means you can work on improving the security of your site, or clients’ sites. You want your website pages to display all their content, but at the same time you want visitors’ information to be secure. With the alerts from the Mixed Content box, you can basically audit pages from your site and figure out if you need to make any improvements so visiting the site is a secure, authenticated and privacy-friendly experience for your users no matter what browser they’re on. If the extension finds non-HTTPS links on the page, they will be listed. You can then choose to remove or replace them to protect your site’s rankings in Google. The Mixed Content box will only be displayed in instances where mixed content that affects a page’s secure connection could be present. Although having an HTTPS/SSL site is only a very light ranking signal for Google, it’s important nonetheless, and you should always implement the best practices recommended by them. While I was reading a bit more about Google counting HTTPS connections as positive ranking signals, I stumbled on this Search Engine Land article. Just for the fun of it, I decided to run Studyr for the URL, and I ended up discovering a great example for what the Mixed Content box displays when there are errors to fix. Basically, you get this full list of potentially harmful elements that should be removed or replaced. If you’re an SEO, you might need to collaborate with a web developer to clean up your HTML, so it’s just as useful when you create or manage websites. Neat stuff. 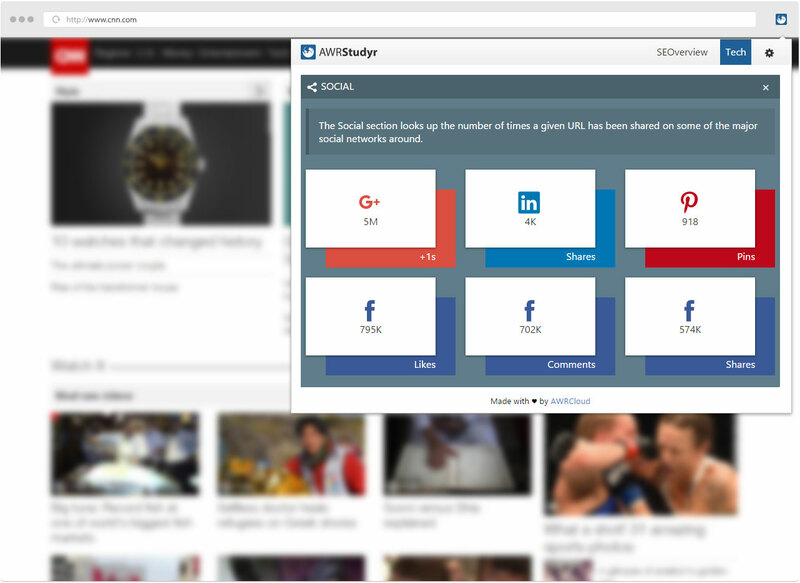 Last but not least, there’s the Social box, where you find metrics for all major social media sites. As you know, Twitter has removed the tweet counter from their social buttons, but AWRStudyr gives you the number of Pins, Google +1s, LinkedIn shares, and Facebook likes, comments and shares. Note: Starting October 11th, 2016 the Social box has been discontinued. The AWRStudyr Chrome extension is available for free on Chrome Store. AWRStudyr can become your go-to helper in situations where you need a rapid assessment of the pages on your website, or when you want a fast way to research your competitors and perform comparisons. We wanted to design a tool that helps those in the online environment be better at their jobs, take quick and informed decisions, and improve their online presence. You can use it for your personal website or blog, or use it on presentations when negotiating with clients. You get free use of Studyr, and we hope it becomes a valuable tool in your everyday activities. We’re really excited about launching it, and super curious to hear what you think of it. Which features are the most useful for you, and how do you plan on integrating it into your workflow? Install AWRStudyr on your browser today and let us know what you make of it! This is my favorite keyword research tool. Easy to peel keywords off competitors and track their keywords to optimize in the future, I probably already rank for it and if not- i want to! I am having trouble with it for the last few days and I recommended it to a colleague, but now it’s not in the site. Is it coming back??? The Research feature will be up and running as quickly as possible. Even though the feature is currently undergoing maintenance, the team is working to finalize the required internal procedure and put it back in service. We’re really sorry for the inconvenience, and hope you can bear with us for a little while. Thanks! Any plans for this to come back? Thanks for your interest, Josh. I’m afraid that for the foreseeable future our plans are to focus on updating and improving AWR’s main functionality – rank tracking, so at least for a while the research project remains on hold. Thank you for making this free but the extension doesn’t have “SEOverview Tab”. Is that no longer a function of the chrome extension? Unfortunatelly the SEO tab has been discontinued and is no longer part of the extension. Thanks for giving the extension a try, Steve!